Having a steam shower in your home is the perfect way to unwind and relax after a stressful day at work and allows you to transform any ordinary bathroom into your own private luxury spa. Steam shower cabins are not only a standard shower—many of which contain amazing features such as monsoon overhead showers and hydro massage body jets—but as the name would suggest, they also double as a steam room, enabling you to let your cares melt away thanks to the calming, healing power of moist, warm air. If you’re considering installing a steam shower in your home, you actually have a number of different options for shape, style and size. So, before you start looking at which specific brand or model to buy, you first need to consider how much space you have available and what type is best for your bathroom and your specific needs. For instance, if you plan on replacing your existing shower or tub with a new steam unit and you only have 1700mm of space wall-to-wall, you won’t be able to use a 1700mm or even a 1500mm model. This is because the fact that even if the unit itself is only 1700mm long on the outside, you’ll still need the additional space to not only properly assemble and install it, but also to be able to access the plumbing and electrics—so make sure you have a look at the Buyer’s Guide for full details on exactly how much space you need before making your purchase. 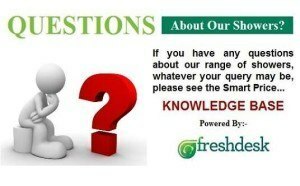 Still, to give you at least somewhere to start and to help you make a better informed decision on which type of steam shower is right for you, we’re here to present you with everything you need to know about the various types available. Corner steam enclosures are probably the most common type and these small quadrant units are sure to fit in virtually any bathroom, as they’re no larger than your standard corner type shower. A small corner unit is anything LESS than 900mm x 900mm and the majority of these models, are either that exact size or the slightly smaller 800mm x 800mm units. If you’re considering one of these smaller corner units, we recommend that you still go as large as you can without taking up too much space and overpowering the rest of your bathroom. You’ll definitely be glad you have the extra space when it finally comes time to use it and in fact, there’s actually not much of a difference in price between the smaller and larger models from the same brand. The large corner steam showers can measure anywhere between 950mm x 950mm, all the way up to a huge 1350mm x 1350mm two person unit, that allows you to enjoy the relaxing effects of steam with a friend or your partner. However, it must be noted that the biggest two person units are really only suitable for a larger master bathroom; otherwise they will dominate the room and not leave you much room to manoeuvre around it. As you’d expect, the larger units do come with a price tag that reflects their size; especially considering the fact that only a few of the more major brands even make steam showers of this size and all of the two person units you’ll find are packed full of all kinds of high-tech features and high-end accessories. Still, if you happen to have the space available and the money to spend, there’s no doubt that you’ll absolutely love the freedom of movement that comes along with the larger shower units. 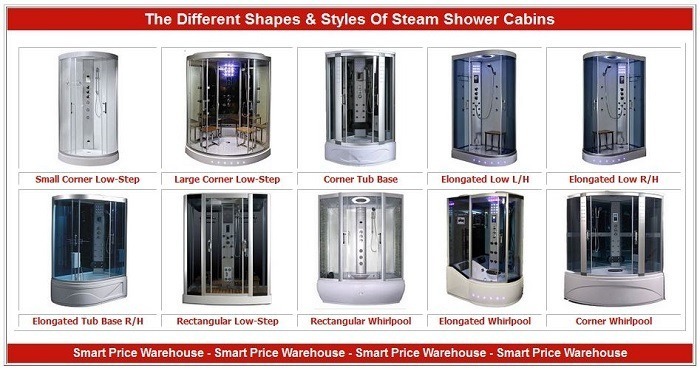 If you still want to enjoy some extra interior cabin room, without taking up quite as much space in your bathroom, then one of these elongated steam showers might be perfect. These units are still designed to fit snugly into the corner of the room, but one side of them is longer than the other, to provide additional interior space. With these units, you have quite a few different size options—such as 1100mm x 800mm, 1100mm x 850mm, 1100m x 900mm, 1200mm x 800mm, etc., and all the way up to the largest 1300mm x 900mm. These elongated models are great because they’ll allow you to have plenty of room to shower, without having to worry about hitting your elbows up against the glass and walls. However, one thing to note with these units is that unlike the standard corner cabins that feature the door in the middle of the unit, with the elongated units you’ll need to choose between a right or left hand model, depending on which corner of the bathroom you’re going to install it in and where you want the radius end with the door. 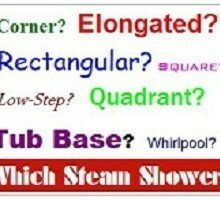 Rectangle steam showers are very similar to the elongated units. The only major difference being that with the elongated type, one end of the unit is always curved, whereas the rectangle units only feature straight lines. With the rectangular shape, the door is normally in the centre of the longer front side, instead of being in the curved end, as with the elongated shape. That being said, the rectangular do come in much larger sizes—with the smallest units measuring around 1100mm x 900mm and going all the way up to 1400mm or even 1500mm x 900mm two person models. The rectangular models are designed to sit in the middle of a wall…they can be pushed into a corner, but do note that these have clear glass sides and the wall covering behind, will be visible. The final and definitely top-end type of steam shower cabin is a whirlpool bath steam shower, which not only provides a steam room and shower, but also a whirlpool bath tub all in one. These units typically resemble either the rectangular or elongated cabins in shape and are available in sizes ranging from 1350mm x 800mm all the way up to the massive 1700mm x 900mm models. 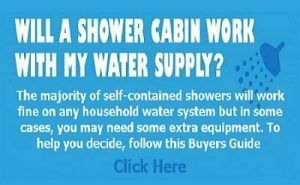 If you’re looking to install a steam shower, but don’t want to have to give up having a bathtub as well, then these models are definitely for you. However, the one thing to note with these units is that, since they also feature a whirlpool bathtub, you’ll have to step up quite high to get into them, so they’re probably not the best option for elderly people or anyone else with mobility issues. 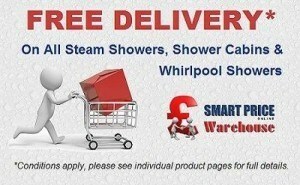 After considering all of your options, you should easily be able to find a steam shower at Smart Price Warehouse that not only fits perfectly in your bathroom or indeed bedroom, but also fits your budget. There is a huge variety of brands and models to choose from, so make sure to do some research first. This accomplished, you should soon be able to enjoy a relaxing spa-quality steam room, in the comfort and privacy of your own home.